Art Improv Auctions are Live! The auctions for the artworks created in yesterday’s Art Improv are now live! What a fun time it was creating these pictures based on requests from friends and fans of my work! Many of these artworks would make great gifts for children or adults, and since we have those gift giving holidays on the horizon, now is a good time to get a head start on your shopping! Each artwork has its own bidding page. Please do not leave bids in the comments of this post. Click on the images of the artwork below for which you’d like to bid. Simply leave your bid in the comments on the artwork’s bidding page, and keep checking back to see if others have made bids after you. There is a “Buy Now” option for each piece. You can buy the piece now for the stated “Buy Now” price as long as no bids have been made before you. Simply write BUY NOW in the comments and the piece is yours for the “Buy Now” price + shipping. Bidding will conclude on Monday, September 22, 2014 at 10 pm ET. Click on images below to get info on each artwork and to make bids. NOTE: I am closing the comments on this post in order to prevent bidding here. Please click on the images above to post your bids or other comments. Thanks! 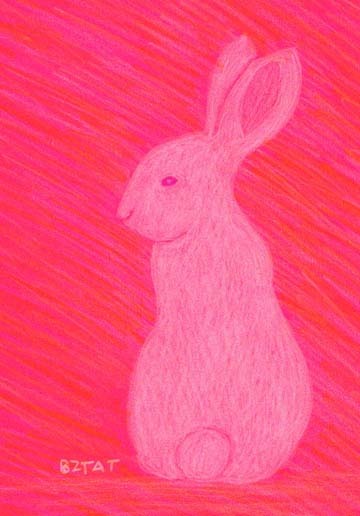 Bunny Art is a better gift than a live bunny. Seriously. Every year, bunnies and baby chicks are marketed to the general public as pets to be given as Easter gifts. It is sad, because most people are not well equipped to keep them as pets. More often than not, these creatures end up in small hutches and cages, and they live a lonely and miserable existence, if they remain alive at all. Regardless of faith, Spring is a time to celebrate new life and new beginnings. My hope is that your Spring is full of great promise and celebration! When I first met Beezie, the cat from whom I got the name BZTAT, I knew I had to paint her. And I did. Over and over and over again for the entire 19 years of her life. I still paint her. Over and over again. 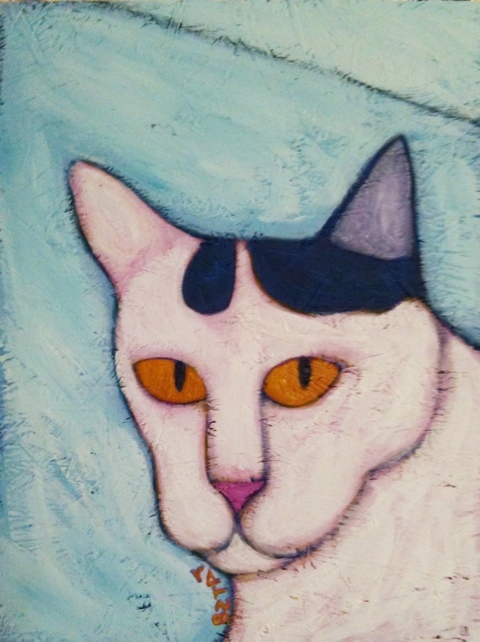 I love painting all of my cats, but there are certain ones who really capture my artistic imagination. Her image is as intriguing to me as her personality is. There is just something about her that really makes me want to draw and paint her. Over and over again. So, be prepared. There will be many, many Okey paintings to come. I hope that folks enjoy them as much as I will enjoy painting them. I painted her the other night because I just needed to paint something for fun and free with no expectations. After doing all the January drawings, it has taken me some time to get back into painting. You may have noticed that I have not posted much here lately. Part of that is due to computer problems that I have been having. Some of it, too, has been because my creative focus has wandered a bit. The winter here in Ohio has been brutal, and I have sorta retreated inward a bit. I am working myself out of it. I have been working to catch up on projects that have been on the drawing table and easel for awhile. Painting the Okey picture kinda loosened me up a bit and got me back into the swing of things. I hope to share the other projects with you soon! In the meantime, I hope you are staying warm and keeping your artistic adventures flowing!